One night when Liza went to bed, Patrick was her chubby, stubby, candy-grubbing and pancake-loving younger brother, who irritated and amused her both, and the next morning, when she woke up, he was not. In fact, he was quite, quite different. When Liza's brother, Patrick, changes overnight, Liza knows exactly what has happened: The spindlers have gotten to him and stolen his soul. She knows, too, that she is the only one who can save him. To rescue Patrick, Liza must go Below, armed with little more than her wits and a broom. There, she uncovers a vast world populated with talking rats, music-loving moles, greedy troglods, and overexcitable nids . . . as well as terrible dangers. But she will face her greatest challenge at the spindlers' nests, where she encounters the evil queen and must pass a series of deadly tests—or else her soul, too, will remain Below forever. From New York Times best-selling author Lauren Oliver comes a bewitching story about the reaches of loyalty, the meaning of love, and the enduring power of hope. 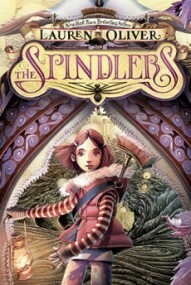 Lauren Oliver debuted in 2010 with Before I Fall, and The Spindlers is her fifth published work, not counting novellas. Her sixth, Requiem, the conclusion to the Delirium trilogy comes out early next year. Simply put, she has blasted into popularity, prolific and talented, to become one of the most loved and admired YA/MG authors. Of the three books of hers I've read, The Spindlers was my least favorite, but still contained some of the wonderful bits that make Oliver's work such a joy to devour. In The Spindlers, Lauren Oliver tackles a pretty standard fairy tale plot: the child whose sibling has been replaced with a changeling and the resulting quest bent on rescue. Liza wakes up to find her brother not himself. He looks the same and he has a lot of the same behaviors, but he is both too nice (perfect table manners and politeness) and too mean (spelling out 'I HATE YOU' to his sister in his alphabet cereal). Liza immediately knows what has happened to him: the Spindlers, spider creatures, have taken his soul, and, should it not be replaced soon, the shell of his body will turn into dust. As is common in middle grade books, only Liza can save her brother from this tragic fate. Her parents refuse to believe her assertions that something is wrong with Patrick and tell her to grow up, now too old for stories. Unwilling to allow her brother to die, Liza determines to go look for him herself, so she goes down to the basement and into the crawl space. Once there, she falls into a deep hole. It turns out the crawl space in her house connects to the Below, a world populated by the magical creatures her favorite babysitter, Anna, always told her about. She immediately gains a companion in the form of Mirabella, a rat who imitates humans. Mirabella also happens to be in possession of a number of articles stolen from her family. I'm glad to know that all of the things I can't find were not in fact lost through my carelessness but swiped by troglods. Mirabella creeps me out a lot. Now, it's not because she's a rat. I know rats can be alright. One of my best friends in college had three rats senior year, and they were friendly creatures. Mirabella, though, sounds every kind of unpleasant. For one thing, she's person-sized. She wears clothing and a matted wig. She smells like a sewer, but covers her face in powder and mascara in an attempt to meet human standards of beauty. Basically, she will probably haunt the dreams of some. Call me vain, but I could not get past my immense distaste for Mirabella. Liza's journey reminded me of any number of books. There was little I found especially original about this tale, except for the nocturni, which were really cool. Otherwise, the monsters, while new to me in name, fit classic molds. Still, I suspect the array of creatures will delight and terrify younger readers as they are intended to do. What Lauren Oliver brings to the story is her way with words. She has a glorious way of writing, one that I think will hold a lot of appeal for children, who also often like stories to follow familiar paths more than I do. For fans of books like Gregor the Overlander or Coraline, The Spindlers will be a delight. This book contains a great story for the young and old alike! It holds your attention throughout the length of the book. The Spindlers was OK, nothing special. I felt Lauren Oliver tried a bit too hard with creating a fantasy world with mystical creatures. I probably would have enjoyed it more if The Spindlers didn't start to bore me halfway through... and I was really looking forward to reading this . I was raised on fairy-tales (who wasn't?) so I LOVE fantasy involving other worlds as well as magical creatures. The story starts off with Liza waking up to find that her brother, Patrick, is not her brother at all, but a replacement. "One night when Liza went to bed, Patrick was her chubby, stubby, candy-grubbing and pancake-loving younger brother, who irritated her and amused her both, and the next morning, when she woke up, he was not." "Across the table, the fake-Patrick began rearranging the cereal letters on the outside of his bowl. He spelled out three words: I H-A-T-E Y-O-U. Then he folded his hands and stared at her with that strangely vacant look, as though the black part of his eyes had eaten up all the color. Here's what the real Patrick would have done: He would have stuck out his tongue, or thrown his napkin at Liza in retaliation, or he would have said, "It's her face that's the bother." But this impostor did none of those things. The impostor just stared quietly at Liza and smiled. His teeth looked very white." *Shivers* Tell me reading that didn't send chills down your spine. Liza is a very truthful person, so after finding out that the spindlers took her brother's soul and planted eggs in his body, she tells her mother that he was taken Below and plans to get him back. Her mother, being stressed out due to unpaid bills, has had enough of Liza and her made up stories. Despite Liza's bravery to venture Below filled with creatures, I didn't like her much. She was a very whiny person. There were only a few characters I enjoyed: Mirabella the rat and the nocturni. I loved Mirabella and her mother-like personality and her sweet voice. I find it rather humorous this particular rat dressed herself as a human and wore a wig as well as make-up. The nocturni were very interesting creatures, they're the ones that gives us are dreams (you'll read more about them). The Spindlers didn't seem like much of an original tale; rather, it reminded of few and I think you'll feel the same way, too. I’m sad to say I was a tad disappointed by The Spindlers, but I think that’s completely due to the fact that I idolize Miss Oliver. It really was a cute, quick adventure. That’s another thing: it took me a little over two days to finish when it really should’ve taken me a couple hours. Not the book’s fault, of course, but it didn’t exactly add to my enjoyment. I found the writing to be a bit off at times. It was rather whimsical and childish in the way of repeating and odd grammar choices, but that doesn’t really mean it’s bad. In fact, I often like that kind of writing in my middle grade, but I think I wasn’t in the right mood for it this time around. I rather appreciated Liza’s commitment to finding Patrick. She didn’t once think “well Patrick can be a bit annoying at times…” or “maybe I’d like being an only child…” She traveled through dangerous situation after dangerous situation to save her admittedly annoying brother. I also quite liked the fact that she went Below scared out of her wits. She didn’t go charging in all brave and awesome (which is cool in its own right, of course) but instead kept pushing on again and again despite her fears. I definitely have to hand it to Oliver on her crazy world-building, though. The world Below is crazy and wonderful and awesome. I mean, we have creatures that protect us and give us dreams; troglods who are kind of like gnomes but steal little trinkets from homes like socks and glasses; glowworms who act as lighting for the underground world; and of course, the creepy and disturbing Spindlers themselves. I don’t want to go into too much detail and ruin it, but I’m definitely left wondering where Oliver comes up with these things! The Nutshell: I didn’t enjoy The Spindlers as much as I’d hoped, but I think it’s my fault, really. In fact, I may revisit Liza’s story one day to see if I enjoy it more. And though I may not have enjoyed it as much as I could have I did still enjoy it. It’s a quick, fun read if you’re looking for a fantastically imagined world and a good adventure. Alice in Wonderland meets Coraline meets Harry Potter! A definite must read! This is my first Lauren Oliver read, and I honestly don't know why I have waited so long to read one of her books! She has created a magical and unique world called Below where dark and creepy things live and come Above to take things that they need. Now, don't let dark and creepy deter you and make you believe that everything Below is bad, looks can be deceiving. Give things a chance, take a closer look and then decide if it's good or bad... The Spindlers was inspired by Maurice Sendak's book called, Outside Over There, a creepy children's book about a little girl who has to go find her baby brother who was stolen by goblins. Definitely not your typical bedtime story - and neither is The Spindlers. One day, Liza wakes up and instantly notices that something is not right with her little brother, Patrick. And she instantly knows what has happened to him - it's the work of a Spindler. A "spindler" is a large spider that has human hands. They come Above (our world), steal people's souls and bring them down Below (there world is under ours) for their Queen. There is no time to hesitate, Liza knows what she must do. As much as a bother little brothers can be, she is the only one who knows what has happened and must go Below and get Patrick's soul back before it's too late. As soon as Liza goes Below, I felt like I was right next to her and was able to picture every single detail that Oliver laid out for us! We quickly meet Mirabella, an eccentric rat who volunteers to guide and help Liza get to the spindlers nest. Now don't judge, not all rats are dirty and scandalous! And Liza's determination, stubbornness, bravery and most of all, her outpouring love for her family - even after her parents ignore her and constantly dismiss her "imagination" - she is an inspirational, motivating and memorable character. If you are a lover of all things from Alice in Wonderland, the dark and magical things from Coraline and the trials and tribulations of Harry Potter - then this is definitely a must have book to add to your shelf!